We are accustomed, in sports, to one moment changing everything; it's probably the main reason we watch. But it's forever fascinating to see how one moment can affect a human being, morphing them from a dominant force of nature to a scared boy in big pants, alone out there. These moments can't make a player more talented, but they can sure make them seem a lot less. It's 80 percent all mental. Which is why, as joyous as we found last night's latest psychological pillaging of Brad Lidge by Albert Pujols, we almost felt bad. 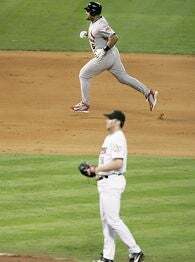 Before Pujols' homer in the National League Championship Series last year, Lidge was as automatic a reliever as Mariano Rivera; he was terrifying to even watch. This year? ERA nearing 5.00, sad lost look on his face, general emotional breakdown. It's not like he doesn't still throw hard or anything; something just seems to be gone. It's scary, because you see it happen to someone like Lidge, and you wonder if it can happen to anyone. It almost makes you want to turn away, because it's so gruesome. Though, of course, we didn't.